SmartCompare will not help you compare prices and will not present special saving deals. This dubious program is represented in a misleading manner to fool computer users into keeping it running on their Windows operating systems. 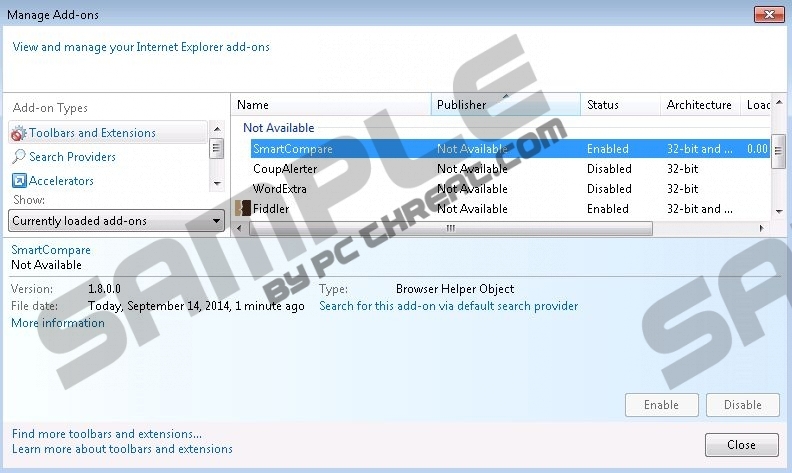 The program does not have an official website; however, you may find it installed onto the PC after running the bundled installers by Amonetize, Vittalia, and other suspicious third-party software distributors. We recommend that you remove all applications presented by these distributors, and right now you need to remove SmartCompare. It is possible that some computer users will discover SmartCompare installed illegally. If this happens, you should realize that the program is unreliable and should be deleted right away. Of course, those who agree to install the program themselves are likely to have more difficulties. First of all, the program is not supposed to display random advertisements, and so some may have no idea why the disturbing online ads are flooding the browsers. Truth is that if you delete SmartCompare, it is likely that all suspicious ads and offers will be removed as well. Note that some ads may be linked to other advert-supported programs running on the PC. You may need to delete these separately. As our malware researchers have discovered, SmartCompare is a clone of CodecEX, Plugster, Savuerone, RightCoupon, and other similar advertisement-supported applications. Despite being presented in different ways and via separate websites, these applications work the same. In fact, it is possible that they have been created by the same people. Adware developers often create multiple versions of the same program to ensure bigger profits. If you do not remove SmartCompare and the infamous clones, they will present advertisements which may be used to boost traffic, collect private information, or promote unreliable installers. Needless to say, the developers of this software will earn money for the provided promotion. This is why we recommend that you delete all adware programs running on the PC. As soon as you identify adware, and you can do this with the help of a malware scanner, you must perform the removal as soon as possible. Since most computer users do not have the skills necessary for the successful manual SmartCompare removal, we believe that automatic malware removal software is more reliable and beneficial. Install a legitimate, up-to-date and reliable security tool, like SpyHunter, to delete SmartCompare, and other malicious programs potentially running on the PC at this very moment. Move to the left of the Task Bar and click Start to open the user menu. Move to the left of the Task Bar and click the Windows/Start button. Select Control Panel to open a menu and then click Uninstall a program. Right-click the program you wish to delete from the operating system. Right-click on the Metro UI screen to open a new tab and select All apps. In the Apps menu select Control Panel and then click Uninstall a program. Quick & tested solution for SmartCompare removal.